The Order of the Smile (Polish Order Uśmiechu) is an international award given to adults distinguished in their love, care and aid for children. The Order of the Smile is a badge representing a smiling sun. 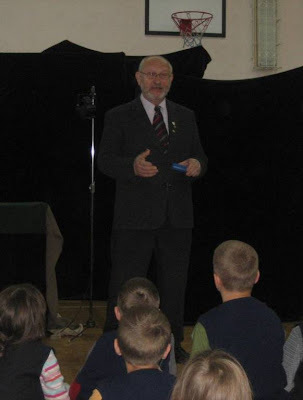 In January 2008 Mr Stanislaw Kwieciński visited Primary School No 5 in Bielsk Podlaski, Poland. Who established the idea of the Order of the Smile? The idea of the Order of the Smile was established in 1968 by the Polish magazine Kurier Polski. The main inspiration went from Wanda Chotomska, Polish poet for children. What is more, in 1979 the General Secretary of the United Nations, Kurt Waldheim, officially recognized the Order, as a result the Order of the Smile became an international order. Who created the project of the order? The Order of the Smile project was created and developed by Ewa Chrobak, a 9-year-old girl from Głuchołazy. She used a plate as a template. Then she drew a sun, and added uneven rays of light. There were over 45,000 project submitted to the contest. That one created by Ewa Chrobak was chosen by Szymon Kobyliński, who elaborated it into its current form. Where is the Order of the Smile awared? The medal is awarded in Poland by the International Chapter of the Order of the Smile, in Warsaw. Who grants the candidates? What are the criteria? All candidates that are chosen by children from around the world. Afterwards the candidates are chosen to be Laureates by the Chapter. The knight of the Order of Smile becomes the adult, whose work is exceptional for children. Where are the members of the Chapter from? The 59 members of the Chapter representatives are from around the world, including: Poland, England, Argentina, Australia, Belarus, Belgium, France, Israel, Canada, Germany, Russia, Tunisia, Ukraine, USA, Hungary, Italy, Romania, Lithuania, Czech Republic, Georgia, Armenia, Japan, Serbia and Montenegro. Who is at the forefront of the International Chapter of the Order of Smile? At the forefront of the Chapter stands the Chancellor, Marek Michalak. Who is among the awarded people? The Order is awarded twice a year. Laureates of the Order of Smile include approx. 900 people from 45 countries. The right to use the title of Knight of the Order of Smile is designated only to those who were decorated at the official ceremony organized by the Chapter. Knights and Dames to receive the Order of Smile include: John Paul II, Mother Teresa, Tenzin Gyatso, 14th Dalai Lama, King Abdullah bin Abdul Aziz Al Saud, Queen Silvia of Sweden, Sarah Ferguson, Tove Jansson, Dagmar Havlova, Jacek Kuroń, Wladyslawa Maria Francuz, Aleksander Palac Astrid Lindgren, Joanne Rowling, Steven Spielberg, Kurt Waldheim, Nelson Mandela, Hilary Koprowski, Otylia Jędrzejczak, Oprah Winfrey, Peter Ustinov, Irena Sendlerowa, and many others.